Mare Barrow’s world is divided by blood—those with red and those with silver. Mare and her family are lowly Reds, destined to serve the Silver elite whose supernatural abilities make them nearly gods. Mare steals what she can to help her family survive, but when her best friend is conscripted into the army, she gambles everything to win his freedom. A twist of fate leads her to the royal place itself, where, in front of the king and all his nobles, she discovers a power of her own—an ability she didn’t know she had. Except…her blood is Red. To hide this impossibility, the king forces her to into the role of a lost Silver princess and betroths her to one of his own sons. As Mare is drawn further into the Silver world, she risks her new position to aid the Scarlet Guard—the leaders of a Red rebellion. Her actions put into motion a deadly and violent dance, pitting prince against prince—and Mare against her own heart. One wrong move can lead to her death, but in the dangerous game she plays, the only certainty is betrayal. If that synopsis and cover doesn’t draw you in, I don’t know what will. As soon as I read the synopsis, I knew this could be a story I would really enjoy. However, I had seen so much hype across my social media accounts that made me a little wary of the book not meeting the high expectations set. I had nothing to worry about. I love the world Victoria Aveyard has created. The book is set in the future, but still has all the fantasy aspects I enjoy in the genre. The main character, Mare, is bitter about her place in life. She’s about to turn eighteen and be conscripted in war where her three older brothers are currently serving. She spends her time stealing to try to provide for her family. After her best friend’s boss dies, Mare takes drastic steps to try to save him from the war. However, nothing goes according to plan and Mare ends up working in the royal palace. Things go from bad to worse when she accidentally discovers, and reveals to the entire royal family and court, that she has her own ability. To cover up, the king proclaims Mare as a lost Silver royal and betroths her to his youngest son. Now Mare is forced into the world she hates so much, and she decides to join the Red rebellion. This quote pretty much sums up most of the book. There are so many plot twists and betrayals that will leave your head spinning and heart breaking. The beginning of the book is slow in order to set up the book, but once Mare gets to the palace, the pacing picks up and I couldn’t put the book down. 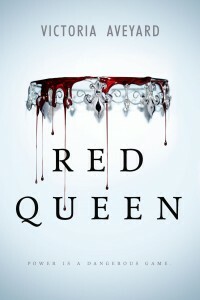 Red Queen has made its way into my list of favorites, and I can’t wait for the sequel. Great review. I’ll have to put this on the list. Thanks! You should definitely add it to your TBR pile!